Being a member of CBGC has become even more rewarding! 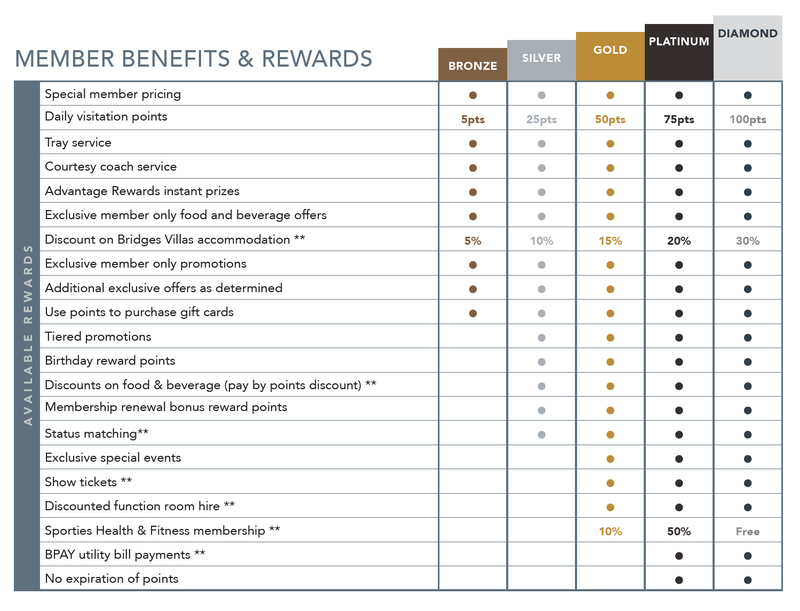 Introducing our new rewards program Advantage Rewards for all CBGC members. Enjoy new benefits ranging from discounts on food and beverage to birthday rewards. Find out more below and if you’re not already a member you download our membership form or come see us at CBGC reception. The number of points you earn per year (rolling 12 month period) determines your Advantage Rewards tier level. HOW CAN I EARN BIRTHDAY REWARDS? Simply visit either of our Clubs during your birthday month, swipe your membership card at the kiosk and your Birthday Rewards will be automatically added to your Advantage Rewards points balance. HOW CAN I EARN VISITATION POINTS? Simply visit the Club and swipe your card at the kiosk. You can use your points to pay for purchases within our Clubs and take advantage of generous discounts when paying with points. Gift cards are also available. WILL MY ADVANTAGE REWARDS POINTS EXPIRE? Advantage Rewards points for Gold, Silver and Bronze levels will expire on 30th June each year. HOW CAN I CHECK WHICH LEVEL I AM IN? Please see one of our friendly Staff Members to check your tier level. HOW CAN I MOVE UP A LEVEL? Each month members who qualify for a higher tier are moved up to their new level automatically. HOW CAN I MOVE DOWN A LEVEL? Each January and July members who no longer qualify for their current level will be moved down to the appropriate level automatically. WHAT HAPPENS TO MY LEVEL WHEN I SPEND MY ADVANTAGE REWARDS POINTS? Your Advantage Rewards Points are a reward for your support of your Clubs, using your points does not affect your tier level. **TERMS AND CONDITIONS: Member eligibility and all rewards and benefits are subject to the terms and conditions of the Advantage Rewards program. Full terms and conditions are available from Club reception. Player activity statements are available on request. Is gambling a problem for you? Counselling and Self-Exclusion may help. ClubSAFE Counselling Service 1800 99 77 66. 24hrs, 7 days. THINK! About your choices. Call Gambling Help 1800 858 858 or visit www.gamblinghelp.nsw.gov.au.